Today for the Jacqueline Blog Tour & Giveaway, we are stopping at Goddess of Sewing, the blogging home of Jordan. Jordan tested my Emily Culottes pattern too, and I loved it so much that I featured it right on my product page. I know that Jordan would do a great job on testing Jacqueline Hoodie. And sure she did! 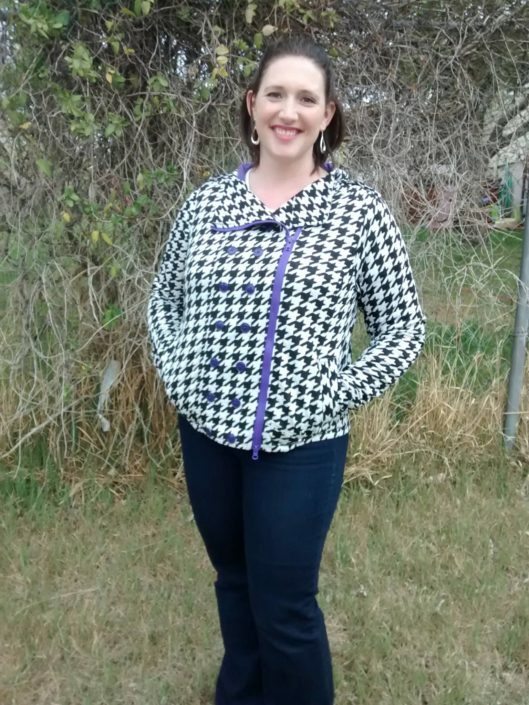 And she even selected a houndstooth fabric to add to the challenge. Not surprisingly, the houndstooth pattern is matched perfectly. After all, she is the Goddess of Sewing. Go over to Goddess of Sewing and read about her experience of making Jacqueline Hoodie. You can enter the giveaway of the Jacqueline Hoodie pattern there too.